Chiropractic care is a system of complementary medicine based on the diagnosis and manipulative treatment of misalignments of the joints, especially those of the spinal column, which are held to cause other disorders by affecting the nerves, muscles, and organs. It is a natural form of health care that uses spinal adjustments to correct these misalignments and restore proper function to the nervous system, helping your body to heal naturally. Chiropractic doesn't use drugs or surgery. Rather, a chiropractic spinal adjustment-the application of a precise force to a specific part of the spinal segment-corrects the misalignment, permitting normal nerve transmission and assisting your body to recuperate on its own. Triggers your body’s ability to heal - Chiropractors recognize that many factors affect your health, including exercise, nutrition, sleep, environment and heredity. Chiropractic focuses on maintaining your health naturally to help your body resist disease, rather than simply treating the symptoms of disease. 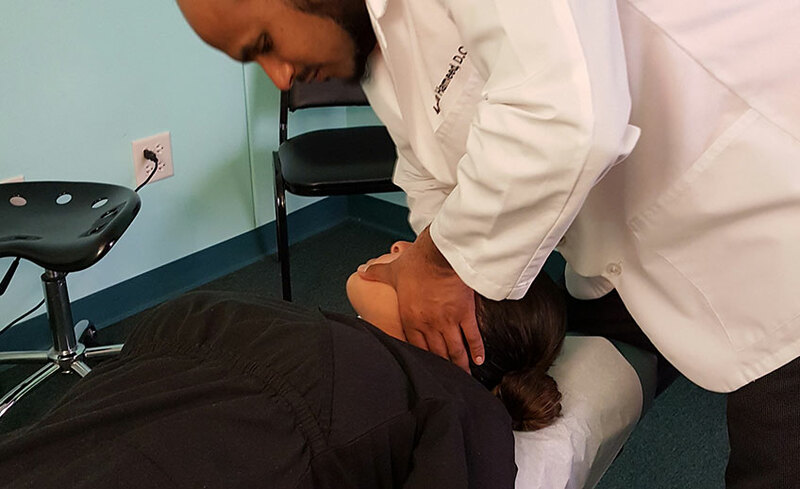 Starts with a thorough evaluation - When you visit a Doctor of Chiropractic, you will be evaluated using time-honored methods, including consultation, case history, physical examination, laboratory analysis and X-ray examination. In addition, you will receive a careful chiropractic structural examination, with particular attention paid to the spine. Involves no drugs or surgery - A broad range of techniques are used to locate, analyze and gently correct vertebral misalignments (subluxations) in the spine. Chiropractors may use manual adjustment, electrical muscular stimulation, ultrasound or massage. But they never use pharmaceutical drugs or invasive surgery. Chiropractic is a natural method of healing that stimulates the body's communication system to work more effectively to initiate, control and coordinate the various functions of the cells, organs and systems of the body. Cox Flexion Distraction decompression adjusting, a specialized form of chiropractic manipulation, has been shown in numerous studies to be an effective and safe technique for lower back pain, neck pain and radiculopathy (Sciatica). It is one of the techniques we use at our office. Diversified technique: Like many chiropractic and osteopathic manipulative techniques, Diversified is characterized by a high-velocity, low-amplitude thrustis considered the most generic chiropractic manipulative technique and is differentiated from other techniques in that its objective is to restore proper movement and alignment of spine and joint dysfunction. Extremity Manipulation/Adjusting: We adjust the upper extremity from the wrist to the elbow to the shoulder and lower extremity from the hip to the knee to the ankle. We are also certified in the application of Kinesiotape and prefer Rocktape. Kinesiology tape offers structural or muscle support; it can correct postural problems and increase blood flow and lymphatic drainage. Although chiropractic works great for back pain relief, at our Aurora Chiropractic office we've helped patients with a wide range of problems.